I have the ability to play volleyball effectively, but during important matches I am not able to show my talent due to shyness. What would help me to keep up my confidence for example give me the ability to spike the ball with the full confidence? It is obvious from your question that you have a "volleyball self- image" problem. Of course, everyone has a "self-image", and it would be defined as "how one feels about themselves as a person". But, you also have a "volleyball self-image", which is "how you feel about yourself as a volleyball player". These two self-images are related, but can be quite different from each other. 1. Visualizations- Whatever we see ourselves doing repeatedly, we grow to believe we can do. Watch yourself making the perfect play in competition time after time. See your teammates and opponents, the crowd, coaches and the scoreboard. Feel the atmosphere and hear the sounds of the competition. Watch yourself making the perfect play to win the point, and thus the match. Then watch, feel and hear the celebration of your teammates, fans and coaches. Do this repeatedly on a daily basis as you lay in bed at night before falling asleep, or in the morning upon waking up. (It is always best to do visualizations when you are the most relaxed physically, and these would be the best two times normally.) It is scientifically proven that visualizing physical performance helps one to train their body to move just as they visualize themselves moving. It is estimated that 99% of all Olympic athletes use visualization as part of their training regimen. 2. Self-Affirmations- Just as we are prone to believing what others say to us about ourselves, we also believe are own thoughts about ourselves. Develop some volleyball specific self-statements and repeat them to yourself on a daily basis many, many times. Make sure the statements are specific to the area of your game you are working to improve, and make sure to say (think) them with a confident, energetic tone of voice. 3. Set Goals- Whenever we set a goal for ourselves that we then achieve, it boosts our self-confidence, which in turn, boosts our self-image. Set challenging, yet attainable goals for yourself concerning your performance of the court. A good rule of thumb is to set out to achieve an improvement of 20 percent, (or two levels on a scale of 1-10). When the goal is achieved, if you want to continue improving, simply rest the goal to improve another 20 percent and keep working. Make sure to write your goals down, and include a specific plan on how you are going to achieve it. When writing your goals, write them in a positive, future tense, such as "I will hit the ball down the line with authority". Put this statement, along with a statement of your achievement plan, on index cards and place it in locations where you will see them every day as you go through your normal routine. Commit yourself to these three steps and stay with them. Psychologists believe it takes a minimum of 21 days of consistent focus to change a part of our self-image. Millions of people from every walk of life have used these techniques to help themselves, and you are no different! You can do it if you simply "put your mind to it". Join in and write your own page! It's easy to do. How? 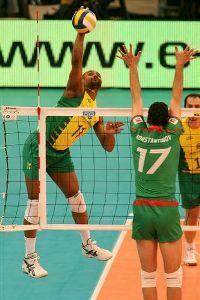 Simply click here to return to Sports Psychology - Have a Question About Mental Training in Volleyball?.